After umpires reversed a balk call in Boston, questions and analysis requests found their way into the UEFL mailroom, giving us today's Rules Review. With two out and one on (R1) in the bottom of the 9th inning of the Blue Jays-Red Sox game (Toronto leading 5-2), Blue Jays pitcher Roberto Osuna moved as if to attempt to pick off Red Sox baserunner R1 Blake Swihart at first base, but upon realizing that no fielder was at the base to take the throw, Osuna stopped his throw, resulting in a balk call from 2B Umpire Sean Barber. Upon consultation with HP Umpire Chris Conroy, 3B Umpire Ron Kulpa, and 1B Umpire/Crew Chief Jerry Meals, the call was reversed and Swihart returned to first base, leading to an argument from Red Sox Manager John Farrell. Official Baseball Rule 6.02(a)(2) states that it is a balk when "The pitcher, while touching his plate, feints a throw to first or third base and fails to complete the throw." The MLB Umpire Manual, in regard to balks, states that, "it is legal for a right-handed pitcher to begin a pickoff move to first base by first moving his pivot foot in the direction of third base provided that he makes a legal step toward first base with the non-pivot foot before throwing there and provided that the move is continuous and without interruption. A pitcher who makes such a pick-off move is considered to be in contact with the rubber when he makes his throw to first base." Using this information, we can review Saturday's play in Boston. F1 Osuna, who is a right-handed pitcher, began his pickoff move to first base by first moving his pivot foot (right foot) in the direction of third base and made a legal step toward first base with the free foot (left foot). 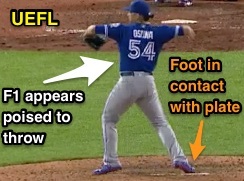 Though the video suggests Osuna's right foot maintained contact with the pitcher's plate/rubber even after the initial movement, the MLBUM interpretation states that his foot nonetheless is to be considered to be in contact with the rubber when he makes his throw. Accordingly, because Osuna failed to complete his throw while touching his plate, he was correctly called for a balk by U2 Barber. The balk rule, however, is designed to prevent a pitcher's deception of the runner, and does state in its comment, that, "If there is doubt in the umpire’s mind [that the pitcher deliberately deceived or attempted to deceive the base runner], the 'intent' of the pitcher should govern." Though it would appear that Osuna did not necessarily intend to deceive Swihart, his actions nonetheless were illegal, which make the initial balk call a correct ruling. Interestingly enough, since fakes toward second base are permissible, the MLBUM states that, "There is no violation if a pitcher attempts a pick-off at second base and seeing no fielder covering the bag, throws to the shortstop or second baseman, neither of whom is in the vicinity of the bag nor is making an actual attempt to retire the runner." This, of course, does not apply to pickoff situations at first or third base due to no-feint Rule 6.02(a)(2); accordingly, such throw deviations are balks (mainly because, again, Rex Hudler thinks balks are hilarious).